A while back (January to be precise), I posted that if you don't blog, you can't work at crayon. For the most part, I don't think this was a particularly provocative statement at all. In fact, I believe that blogging is a bare minimum in terms of demonstrating both a baseline understanding of the space and being able to apply this in first-hand, practical terms. Whilst some people argued that Twitter should count as a blogging equivalent, I largely ignored them as twits. Whilst it might sound elitest and a tad snobby, it's too bad. That's the way it is. To be a crayonista, you need to be a prolific thought leader and to prove it, you need to be a published author. Anything else is just fooling yourself into believing you're better than you actually are. I'm kidding of course (kind of). The real reason for this post is to congratulate fellow crayonista and our Chief Strategy Officer, Greg Verdino on his own book deal. 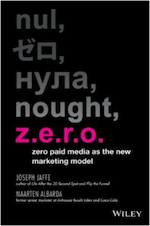 Greg is writing a book on microMARKETING and his book is slated to be released in Q2 of 2010. My third book is due out in Q1 of 2010 so it's going to be a busy first half of 2010 for crayon! Enter micromarketing – a new approach to building brands, marketing products and services, and growing meaningful long-term customer (and corporate) value. Micromarketing emphasizes relationships over reach, interactions over interruption, and the network effect over the broadcast network. It is built upon the premise that the “next big thing” is really lots and lots of small things, and that to survive and thrive, even the biggest marketers must think and act small (make that “micro”), too. Congratulations Greg....welcome to the author's club. I'll pass on the secret handshake, codewords and underground meeting schedule when I see you next. Finally, an agency gets it right. I say that tongue-in-cheek of course, because they've chosen video (much like I've done with JJTV) to demonstrate that they understand how to best use new media to tell an old story so to speak. Specifically, they're showing their understanding of non-linear storytelling brought to life through YouTube annotations and hyperlinks. And if you don't know what I'm talking about, give Boone Oakley a call...they deserve the shot to teach an old dog (you), new tricks. It remains to be seen whether this agency actually is a cut above its competitors, BUT they've certainly been able to get their proverbial feet in the door, make their pitch (independence over conglomerendence) and I'll bet that you spent more than 30-seconds being entertained by (gasp) a sales pitch. Quite lovely. Well done, lads and ladesses.